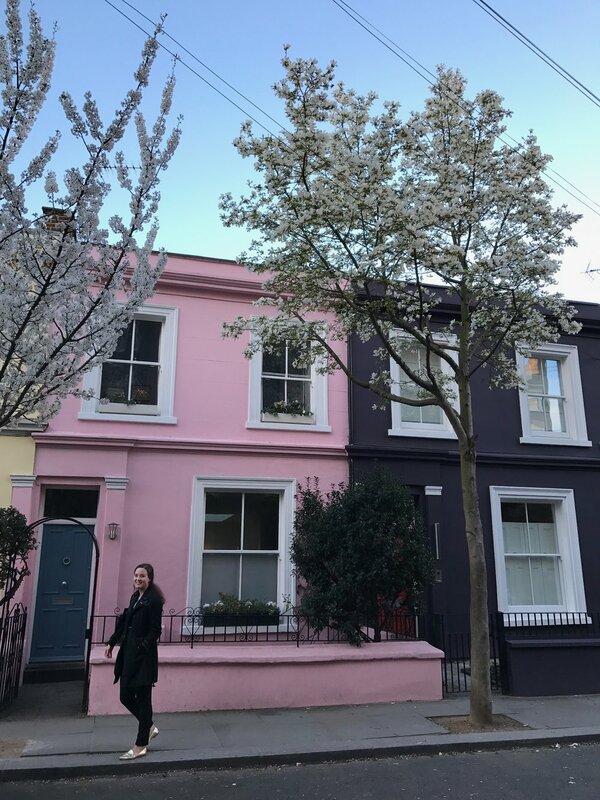 Magnolia petals scattered across sidewalks, a bit of rain here, a bit of sunshine there and always a breeze coming off of the Thames: London no one does Spring quite like you! Every trip to London has been a delight and since I moved to the U.K approaching two years ago, I’ve called on the lovely city many a time. Something about the graceful architecture and bustle of people simultaneously invigorates and relaxes me. Stylish and full of history, the sheer ratio of museums and shops to city blocks never fails to win me over. Add in a sumptuous afternoon tea (the most chic version of snack time I’ve ever come across) and I’m in love. How can you not adore a city with a neighborhood full of the prettiest pastel houses? There’s nothing like exploring with a native and my friend was kind enough to bring me to some of her favorite spots. Walking in the fading evening light and picking out dream flats for the postgraduate city migration. Well one can dream!